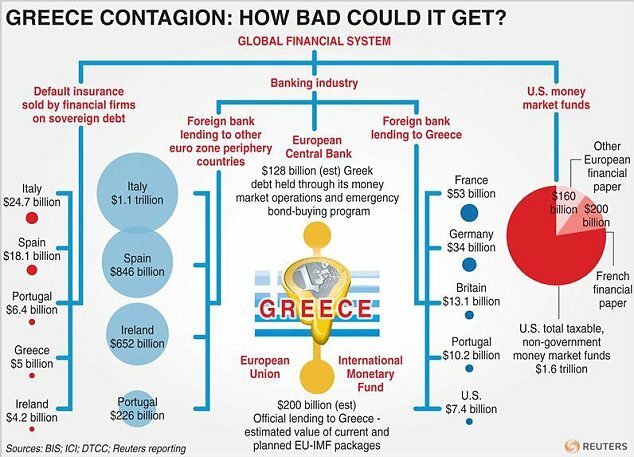 $ 29 Trillions: How the Fed bailed out unsustainable European Financial Institutions with the highest (legitimate?) discretion. During the unfolding of the post subprime financial crisis, the Federal Reserve System secretely lent a staggering amount of money to corporations and financial institutions worldwide, including Europe. The total amount of money the Fed injected into the system in three years doubled Total US GDP. The verification of this fact is the result of the joint efforts of current and former members of Congress: Ron Paul, Alan Grayson and Bernie Sanders. As the three show in their biography, political differences fade when the common denominator is money. They accomplished the important result of auditing the Federal Reserve and it turned out in the report published on 21st July 2011 that from 2007 to 2010 the Fed secretly lent out at least 26 trillion dollars in order to save incompetent but rich investors. At page 131 of the GAO report, table 8 shows that total lending for the Fed’s “broad-based emergency programs” was $16,115,000,000,000. At page 205, the autidors added another $10,057,000,000,000 in “currency swaps” with central banks in order to fund bailouts in different countries. 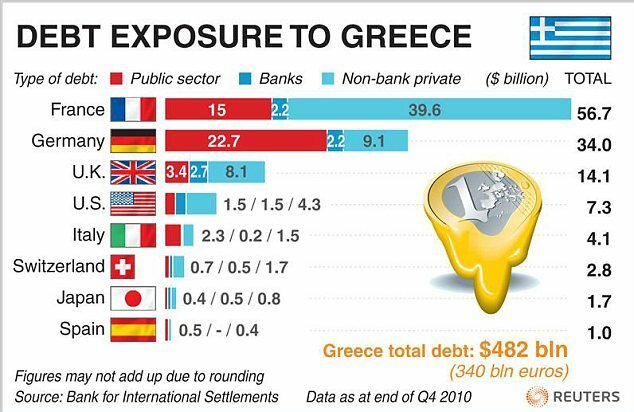 A number of European financial institutions were granted loans from the Fed, de facto questioning the concrete role of the ECB and the legitimacy of central banking more at large: Barclays PLC (United Kingdom): $868 billion ($868,000,000,000); Deutsche Bank (Germany): $354 billion ($354,000,000,000); UBS (Switzerland): $287 billion ($287,000,000,000); Credit Suisse (Switzerland): $262 billion ($262,000,000,000); Bank of Scotland (United Kingdom): $181 billion ($181,000,000,000); BNP Paribas (France): $175 billion ($175,000,000,000); and many many many more. On 23rd December 2011, economist L.Randall Wray presented the results of a study whereby the figure must be adjusted to 29 trillion dollars. As outrageous as it may sound, 29 trillion dollars in nevertheless a small part of the sum of money that the monetary, banking and financial system needs to bail out itself. Indeed, the financial martket has become a sort of casino, where operators gamble without concerns to the relationshp between real economy and financial markets. Society is carrying a 600 trillion dollars Time Bomb set to explode: The world’s gross domestic product (GDP) is only about $65 trillion, or roughly 10.83% of the worldwide value of the global derivatives market, according to The Economist. The current unsustainable and apparently unlegitimate system is falling apart very quickly and pretty chaotically, at least this will may reveal of help for those willing to build up a better system. The United Kingdom, the Minsky Moment, and Why the US cannot Sustainably Bailout Europe: Hang on Your Hat! At this point, neither the US nor the IMF can step in and bailout Eu-rope – as Prof. Anthony B Sanders put it quite clearly. The Icelandic way is every day more attractive. European Stability Mechanism: Dictatorship in Waiting? Europe's Web of Debt - published by Bill Marsh/NYTsource: Bank for International Settlements. 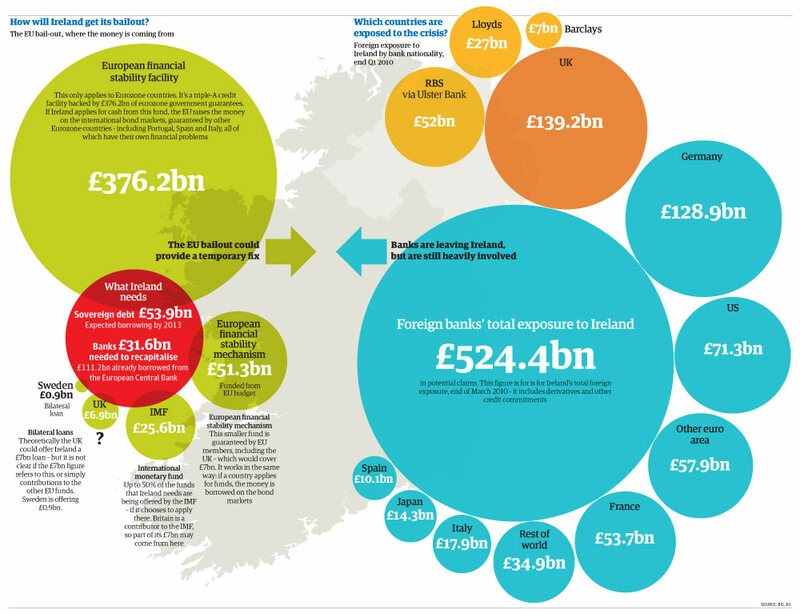 Europe's Datablog Ireland bailout: the Datablog guide to who will fund it and which countries are most exposed - Illustration: Jenny Ridley for the Guardian.